Back when folk songs were common, almost everyone knew the song of the "Hunter of Kurpfalz". Today, this song is sung mostly in choral societies. Very few know that the hunter of Kurpfalz (1732-1795) was born a hereditary forester named Friedrich Wilhelm Utsch, in Rheinböllen in the Hunsrück. He owned the "Maltese Hospital". His official seat was the "Entenpfuhl" forester's house 10 km north of Bad Sobernheim. It is easy to reach on well-marked paths leading from the "Kurhaus am Maasberg" at the nature preserve Maasberg, through the Soon forest and over the "Zollstock". There is a memorial to him there, erected in 1913. Not far from Entenpfuhl is the village of Auen. 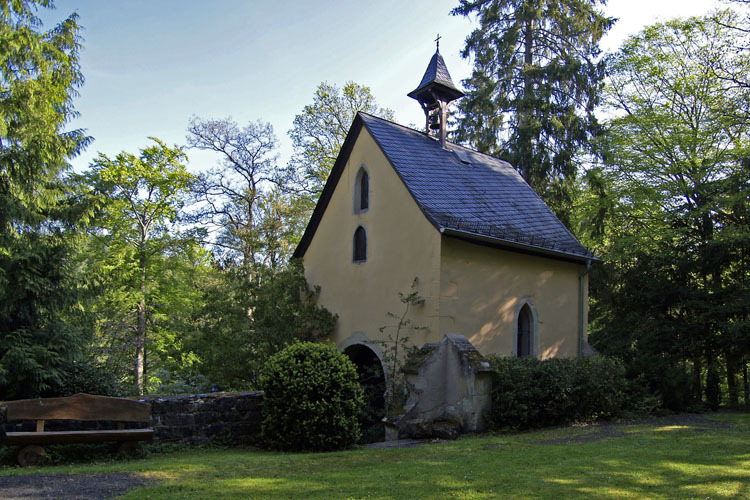 Especially beautifully situated on the edge of the forest is the thousand-year old Willigis chapel, where the hunter of Kurpfalz is entombed. At the Struthhof, a few kilometers from the forester's house at Entenpfuhl, another plaque memorializes Johann Adam Melsheimer who, before the time of Utsch, in the years 1719-1757, was the "Riding Forester in the Lower Soonwald". Many see in him the legendary Hunter of Kurpfalz. What is certain is that both men were foresters and "hunters" over many years in the Soon forest.